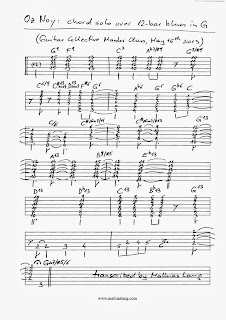 in my previous post I talked about Oz Noy and the scales he demonstrated over a 12-bar blues in G. Even though his single note solo contains a lot of interesting melodies and note choices, I decided to transcribe the very last chorus, where he plays an improvised chord solo. I really like studying chord progressions, chord voicings, and voice leading. 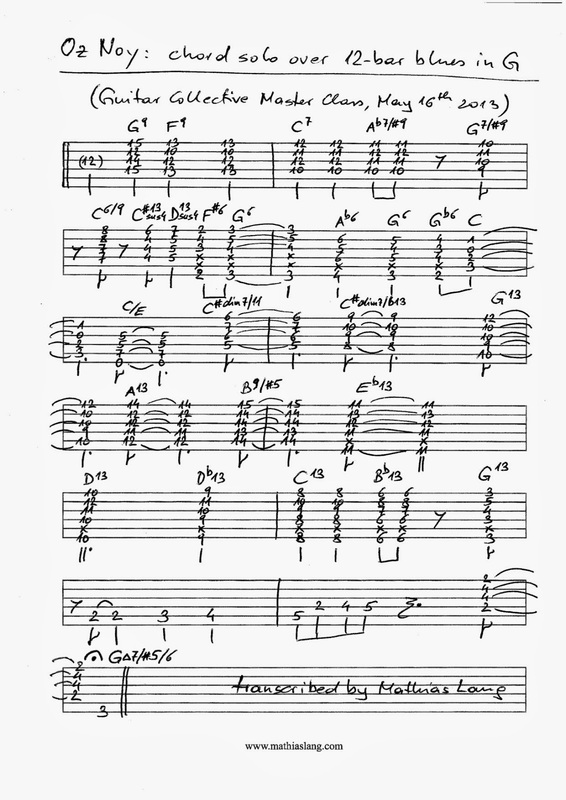 Oz Noy's chord solo was yet another challenge to try to hear (and understand) what's going on. It keeps amazing me how much you can do with a simple 12-bar blues progression. If you check out the transcription below, note the identical voicings for the dominant chords Ab7/#9, G7/#9 and for the diminished chords C#dim7/11, C#dim7/b13. This is a cool sounding voicing taken from the diminished (whole-half) scale (for dominant chords, it is actually taken from the half-whole scale, which is just a shifted version of the diminished scale). Another chord worth noticing is the final chord. Even though the tonic chord of a standard blues is a dominant chord - G7 in this case - Oz Noy switches to a major7/#5 for the final chord, which is basically a B major triad over a G bass note, check it out!